Print the Paleo Pumpkin Pie recipe here! It’s fall y’all. Soon enough we’ll be doing the happy dance in cool weather, wearing our scarves and boots, and going to pick out pumpkins. I have full intentions of taking Lorenzo to a pumpkin patch too. Family portraits at the pumpkin patch? Oh yes! Here I am, awake again since 1:45am (what’s wrong with me?!?!) so after completing my bible study and a gagillion other tasks decided to go ahead and write this blog post before the sun even comes up. I mentioned last week that I decorated for fall and these are the white ceramic pumpkin bowls I’ll be using on the Thanksgiving table!!! I bought them on super sale for $6 per set of four or something insane like that, but it was after Thanksgiving so of course you run the risk of them selling out before then…and they did. I called around to multiple locations to finally locate one that had the twelve I wanted. Mix all of the ingredients together using a hand mixer. Grease the pie pan using coconut oil and pour the pie mixture into the pan. Bake the pie for about 75 minutes at 350* F. Make sure to watch the pie as all ovens vary and test for it to be done baking by inserting a toothpick into the middle. It should come out clean. Allow the pie to cool some before serving warm. Store in the refrigerator. How easy is that??? Plus, it’s truly so delicious! I promise you will not miss the crust. The pie is super moist and you can serve it with whipped coconut cream or regular whipped cream and ice cream if you’re not Paleo. You can adjust the amount of honey to accommodate your desired sweetness as well as toy with various other Paleo approved sweeteners if you desire to. I hope you enjoy this treat! This is my third or fourth year making it and it will always be a repeat. Plus, I try to always keep a can of pumpkin and a can of coconut milk in my pantry so it’s easy to whip this up if it comes to mind. 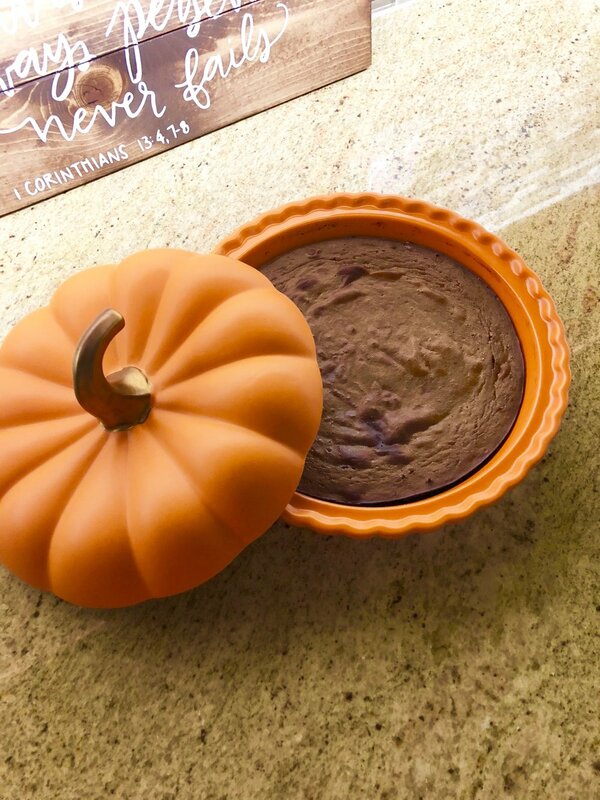 Have you made any pumpkin recipes lately to share? I’m always interested in new recipes!